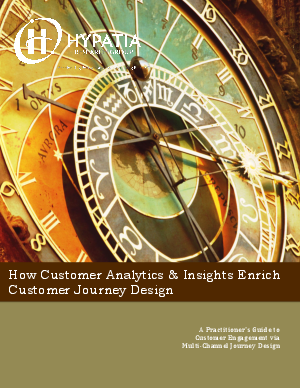 In this age of digital engagement, interaction, and commerce, analyses of customers' interactional and transactional behaviors with the goal of creating actionable business insights are essential in designing effective multi-channel customer journeys. Business intelligence applications and dashboards are useful for reporting and providing historical or near -real time guidance and trends. However, transforming massive amounts of customer information (structured and contextual) into actionable insights is a significant challenge for organizations of all sizes, across all industries and all geographies.